The city was founded by the Voortrekkers, following the defeat of Dingane at the Battle of Blood River, and was the capital of the short-lived Boer republic, Natalia. Britain took over Pietermaritzburg in 1843 and it became the seat of the Natal Colony's administration with the first lieutenant-governor, Martin West, making it his home. Fort Napier, named after the governor of the Cape Colony, Sir George Thomas Napier, was built to house a garrison. In 1893, Natal received responsibility for their own government and an assembly building was built along with the city hall. On 7 June 1893, while Mahatma Gandhi was on his way to Pretoria, a white man objected to Gandhi's presence in a first-class carriage. Despite Gandhi having a first-class ticket, he was ordered by the conductor to move to the van compartment at the end of the train: he refused, and he was removed from the train at Pietermaritzburg. In 1910, when the Union of South Africa was formed, Natal became a province of the Union, and Pietermaritzburg remained the capital. During apartheid, the city was segregated into various sections. 90% of the Indian population was moved to the suburb of Northdale while most of its Zulu inhabitants were moved to the neighbouring township of Edendale and white inhabitants were moved out of those areas. There exist two interpretations about the origin of the city's name. One is that it was named after Piet Retief and Gert (Gerrit) Maritz, two Voortrekker leaders. The other is that it was originally named after Piet Retief alone, since his full name was Pieter Maurits Retief. In this interpretation the original name was "Pieter Maurits Burg", later transliterated to the current name (Jenkins, 1971:11). At the time of the rise of the Zulu Empire, the site that was to become Pietermaritzburg was called Umgungundlovu. This is popularly translated from the Zulu as "Place of the Elephant", although it could also be translated to mean "The elephant wins". Umgungundlovu is thus thought to be the site of some Zulu king's victory since "Elephant" (Indlovu) is a name traditionally taken by the Zulu monarch. Legend has it that Shaka had his warriors hunt elephant there to sell the ivory to English traders at Durban (then called Port Natal). Today, the town is still called by its Voortrekker name, although the municipality of which it is part bears the Zulu name. The University of Natal was founded in 1910 as the Natal University College and extended to Durban in 1922. The two campuses were incorporated into the University of Natal in March 1949. It became a major voice in the struggle against apartheid and was one of the first universities in the country to provide education to black students. It became the University of KwaZulu-Natal on 1 January 2004. The city hall, which is the largest red-brick building in the Southern Hemisphere, was destroyed by fire in 1895, but was rebuilt in 1901. It houses the largest pipe organ built by the Sheffield organ building company, Brindley & Foster. In 1962, Nelson Mandela was arrested in the nearby town of Howick to the north of Pietermaritzburg. The arrest marked the beginning of Nelson Mandela's 27 years of imprisonment. A small monument has been erected at the location of his arrest. Immediately after his arrest Mandela was taken to the Old Prison in Pietermaritzburg. After a night in the prison, he was taken to Magistrate J. Buys’s office in the old Magistrates Court Building in Commercial Road (now Chief Albert Luthuli Road), and was remanded for trial in Johannesburg. Prior to 1994, Pietermaritzburg was the capital of Natal Province. 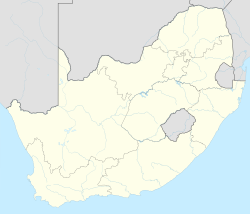 Following the first post-apartheid elections in South Africa, as a result of which the Inkatha Freedom Party won a majority in the KwaZulu-Natal provincial government, Pietermaritzburg shared its status as capital of the (then newly created) province of KwaZulu-Natal with Ulundi. Pietermaritzburg became the legislative capital of the new province, while Ulundi became the administrative capital. The IFP, being strongly Zulu nationalist, desired that Ulundi, the capital of the Zulu Kingdom at the time of its fall to the British in the Anglo-Zulu War, be the post-apartheid capital of the province. 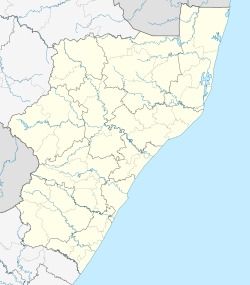 Ulundi had also been the capital of the bantustan KwaZulu, which makes up a portion of modern KwaZulu-Natal. However, Ulundi severely lacked the infrastructure to be an effective seat of government, and the African National Congress (ANC) and the Democratic Party, the two other strong political parties in the province, among others, called for Pietermaritzburg alone to be the capital. The debate came to an end when the ANC came to power in the province in 2004, and named Pietermaritzburg the sole capital of KwaZulu-Natal. This has resulted in the relocation of several government offices to Pietermaritzburg. This has generally been welcomed as a positive development for the region. Since 2004, progress such as the modernisation of several buildings in the city centre and a proliferation of retail and housing developments in the suburbs are results of recent investment in the city by both the public and private sectors. Until the late-1990s, the region was renowned for the production of high quality textile, clothing and footwear products. An example of the latter included the production of Doc Marten shoes. However, these industries have declined in the area due to lower production costs in Asia. Extensive timber plantations and numerous citrus farms surround the city, contributing a significant share of the city's output. The Liberty Group has made major investments in several phases in the region since 2002 with the development of the Liberty Midlands Mall (the area's largest shopping centre by gross lettable area and its most prestigious) and Stay Easy hotel. Hulett's Aluminium and Willowton cooking oil contributes a substantial part of the region's industrial output. The Pietermaritzburg borough council assumed a coat of arms in 1861. The shield depicted an elephant standing on grass, and a cross of five stars was placed above the shield. The motto was Umgungunhlovu. It is unclear what the original colours were, but by 1910 the shield had been coloured blue. By 1931, the council had approved new artwork in which the stars were placed on a radiant sun. The arms were registered with the Natal Provincial Administration in November 1950. Many early renditions of the coat of arms, visible on older public building and wrought iron lampposts, features an elephant which is clearly an Asian Elephant rather than an African elephant. More recent versions reflect an African elephant. The final version of the arms was granted by the College of Arms in May 1961. It was registered at the Bureau of Heraldry in May 1973. The blazon was : Per fess Azure and Vert, over all an elephant statant Or, tusked Argent (i.e. the shield was divided horizontally into blue over green, and displayed a gold elephant with silver tusks). The crest was changed to a blue sun displaying gold and silver stars, and two black wildebeest were added as supporters. Each had a shield on its shoulder, the dexter supporter's shield displaying the Union Jack and the sinister supporter's the flag of the Natalia republic. Pietermaritzburg is on the N3 highway, the primary route between the harbour city of Durban, some 90 kilometres (56 mi) away, and the Pretoria-Johannesburg-Witwatersrand conurbation. The R33 connects Pietermaritzburg with Lephalale via Greytown, Paulpietersburg, Carolina, Belfast and Vaalwater to the northeast, while the R56 connects Pietermaritzburg with Cape Town via Ixopo, Kokstad, Mthatha, East London, Port Elizabeth, George and Mossel Bay to the southwest. The R56 road becomes co-signed with the N2 highway at Stafford's Post. The city is served by Pietermaritzburg Airport, which has regular scheduled services to OR Tambo International Airport in Johannesburg and Cape Town International Airport in Cape Town. Pietermaritzburg Railway Station is served by trains on the Johannesburg-Durban and Cape Town-Durban routes of Shosholoza Meyl. It has been mooted that the Metrorail commuter rail system be expanded from Cato Ridge to Pietermaritzburg. Regular daily bus services connect Pietermaritzburg to other major cities in South Africa. The bus station is located on Burger Street, opposite the McDonalds Centre, and it serves major bus companies. Greyhound and Intercape is the most reliable and it operates several round-trips from Durban to Johannesburg daily, where Pietermaritzburg is the second to last stop before Durban. Pietermaritzburg has two types of taxi services: metered taxis and minibus taxis. Unlike in many cities, metered taxis are not allowed to drive around the city to solicit fares and instead must be called and ordered to a specific location. A number of companies service Pietermaritzburg and surrounding areas. These taxis can also be called upon for airport transfers, point to point pickups and shuttles. Minibus taxis are the standard mode of transport for the majority of the population who cannot afford private vehicles. A bus rapid transit system is currently being developed in Pietermaritzburg. The initial phase would see the development of a west to east corridor from Edendale to Northdale. The BRT route will traverse the CBD along Church Street. Pietermaritzburg has a humid subtropical climate with distinct wet and dry seasons. Summers are warm and occasionally hot, with frequent rainfall. Winters are dry with high diurnal temperature variation, with light air frosts being possible. The Comrades Marathon takes place annually in June between Pietermaritzburg and Durban. It has been run since 1921 and attracts thousands of entrants. The start of the race alternates between the two cities. The yearly Amashovashova is a 106 km (66 mi) road cycling classic race held since 1986 which starts in Pietermartizburg and finishes in Durban. It is normally held in October. In January there is an annual canoe race, the Dusi Canoe Marathon, from Pietermaritzburg to Durban. The route follows the Msunduzi River into the Mgeni River, through the Valley of a Thousand Hills into the Inanda Dam and from here to the mouth of the Mgeni River. The Midmar Mile is one of the largest open-water swimming events in the world; taking place at Midmar Dam, north of Pietermaritzburg in February every year, it attracts over 16,000 swimmers from around the world. The Harry Gwala Stadium is a Multi-purpose stadium, and is mostly used for football matches, it is the home ground of Premier Soccer League club Maritzburg United. The Pietermaritzburg Msunduzi Athletics Stadium is currently being developed. The Pietermaritzburg Oval is considered one of the most picturesque cricket grounds in South Africa, and it hosted two matches during the 2003 Cricket World Cup. Pietermaritzburg cricket ground is notable as one of the two grounds used regularly for first-class cricket that have a tree within the boundary (the other is St Lawrence Ground in Canterbury, Kent). Woodburn Stadium is currently used for most club rugby in Pietermaritzburg. The Kershaw Park Tennis Complex is a tennis stadium. The above facilities form the centre of the Pietermaritzburg sports precinct. Between December 1953 and November 1981, Pietermaritzburg had an international standard motor racing circuit located on the outskirts of the city. The Roy Hesketh Circuit measured 2.902 kilometres (1.803 mi). The circuit was named after South African driver Roy Hesketh. During its period of operation it hosted rounds of the South African National Drivers Championship, the Springbok Series and national Formula Atlantic races. The circuit was also like a second home to Mike Hailwood. The track was known for hosting the Easter races as well – a festival of racing over three days. The expansion of the town of Pietermaritzburg eventually led to the redevelopment of the site as a residential and business zone after racing ceased at the end of 1981. The section from Henry's Knee to the top of Beacon still exists, and is undergoing protection from further development as an important piece of Pietermaritzburg's history. From 1948 until 1953 races were held at the 5.5-kilometre (3.4 mi) Alexandra Park Street Circuit on streets within the town of Pietermaritzburg. In 2010, the BMX Racing World Championship took place in the city of Pietermaritzburg between 15 July and 1 August. Former Springbok and World Cup Winner Joel Stransky was born in Pietermaritzburg on the 16 July 1967, he also matriculated from Maritzburg College. Former South African Cricketer Jonty Rhodes was born in Pietermaritzburg on the 27 July 1969, he also attended Merchiston Prep school and later matriculated from Maritzburg College. South African cricketer David Miller was born in Pietermaritzburg on 10 June 1989. The English cricketer Kevin Pietersen was born in Pietermaritzburg on 27 June 1980, as was the Springbok cricketer Cuan McCarthy. Pietermaritzburg is home to the oldest football (soccer) club of South-Africa and the African continent : Savages FC PMB, founded in 1882. Some of the area's tourist attractions include; the KwaZulu-Natal Museum, City Hall, Colonial Buildings, Imperial Hotel, Comrades House and SANBI Botanical Gardens. Attractions in the surrounding areas include; Albert Falls Nature Reserve, Howick Falls, Midmar Public Nature Reserve, Queens Elizabeth Park and World’s View. Pietermaritzburg has a well-developed higher system of public universities. Pietermaritzburg is served by two public universities, University of KwaZulu-Natal and Durban University of Technology. There are also many private and public colleges operating in the city, some of the larger colleges are: Umgungundlovu TVET College, Varsity College, and Rosebank College. Pietermaritzburg is home to a number of prominent civil society organisations including the Abahlali baseMjondolo (shackdwellers) movement, GroundWork, CINDI, PACSA, and the KwaZulu Natal Christian Council. Jonathan Handley, singer-songwriter (born 5 June 1954), originally from Springs, founder of The Radio Rats who in 1979 had a hit single "ZX Dan" on Radio 5 (now 5FM). Bessie Head, writer, was born in Pietermaritzburg in 1937. Roy Hesketh, (1915 - 19 September 1944) racing driver and South African Air Force pilot. Butch James, Springbok and Sharks rugby player attended Maritzburg College from 1994 to 2000. He played for Colleges' 3rd team. Stratford Johns, (22 September 1925 – 29 January 2002) British stage, film and television actor. Left for Britain in 1948. Charlie Llewellyn, cricketer (born 29 September 1876), first non-White Test cricketer for South Africa. Greg Minnaar, three time Downhill World Cup champion (2001, 2005, 2008). He was also crowned Downhill World Champion in 2003. He attended Carter High School. Shaun Morgan, lead singer of Seether, is a former resident of Pietermaritzburg and attended both Merchiston Preparatory School and Maritzburg College while he lived there. Alan Paton, author of Cry the Beloved Country, was born in Pietermaritzburg. Kevin Pietersen, cricketer (born 27 June 1980). Tom Sharpe, novelist, who described the city as "half the size of a New York cemetery and twice as dead". Dale Stewart, bassist of Seether, former resident of Pietemaritzburg. Built in 1900, the City Hall was then the largest all-brick building in the southern hemisphere. It was declared a national monument in 1969. At 14 metres high, the statue Pegasus adorning the entrance of the Golden Horse Casino was the largest statue of a horse in the world. However, as of July 2010, the statue has been demolished due to internal structural damage. ^ "Msunduzi - Mayors Column". msunduzi.gov.za. ^ a b c d "Main Place Pietermaritzburg". Census 2011. ^ Rhoodie, E. M.; Keith S. O. Beavon (1976). "Pietermaritzburg". In William D. Halsey. Collier's Encyclopedia. 19. New York: Macmillan Educational Corporation. p. 43. ^ "History of the University of KwaZulu-Natal". ^ "The Old Prison". projectgateway.co.za. Archived from the original on 2011-01-11. ^ "Mandela and Pietermaritzburg - Maritzburg Sun". Maritzburg Sun. ^ Anon. ; 'Maritzburg's Municipal Insignia' in Archives News (Jan 1975). ^ The arms were depicted on a colour poster issued by the Cape Times in 1910. ^ Natal Official Gazette 2317 (9 November 1950). ^ "Climate data for Pietermaritzburg". South African Weather Service. Archived from the original on 8 March 2010. Retrieved 7 March 2010. ^ "Roy Hesketh the Racing Drivers Story". Roy Hesketh Circuit. Archived from the original on 1 September 2018. Retrieved 16 May 2013. ^ "IMCA-slotracing.com". IMCA-slotracing.com. Retrieved 15 May 2011. ^ "Alexandra Park Street Circuit". Guido de Carli. ^ "World Habitat Day". Rajpatel.org. Retrieved 15 May 2011. ^ "Cindi - Children In Distress Network". cindi.org.za. ^ "GroundWork". GroundWork. Retrieved 15 May 2011. ^ "South Africa: Post Abahlali baseMjondolo AGM speech by S'bu Zikode". Africafiles.org. 14 December 2008. Retrieved 15 May 2011. ^ Carlton, Melissa. "Biography". Archived from the original on 2 October 2012. Retrieved 16 January 2012. ^ "Pietermaritzburg – Home Of Gandhi and The Comrades Marathon". Encounter South Africa. Archived from the original on 17 January 2007. Retrieved 1 January 2007. ^ "Pietermaritzburg Tourism". Archived from the original on 24 September 2006. Retrieved 1 January 2007. ^ "Golden Horse Casino Hotel". CyberCapeTown Greater Durban Area Accommodation Portal. Archived from the original on 7 July 2012. Retrieved 1 January 2007. ^ "Sister Cities of Hampton, Virginia". Retrieved 7 November 2011. ^ "Sister Cities International". Retrieved 7 November 2011. Wikivoyage has a travel guide for Pietermaritzburg. Wikimedia Commons has media related to Pietermaritzburg.